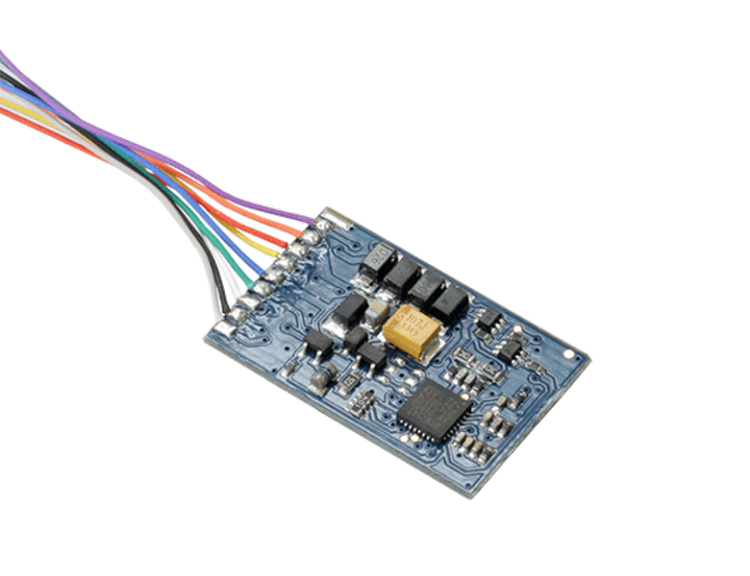 While our LokPilot V4.0 decoder without doubt meets the most extravagant requirements even of the most sophisticated experts, many modellers are looking for a robust, high quality DCC decoder for their standard requirements, which should also be easily affordable. You may stop searching right now: our new LokPilot Standard has been developed from scratch with the objective to provide an up-to-date decoder that meets most of the required functionality on the one hand while going easy on your wallet. We supply the LokPilot Standard in three versions: besides the version with the 8-pole NEM interface and the one with the 21MTC plug, the decoder will also be supplied as a particularly compact type with the PluX12 interface, if required. Thus the LokPilot Standard is not only suitable for H0 vehicles but also for locomotives in TT or N gauge. The most modern technology globally available has been built into the LokPilot Standard. Based on a 32 Bit CPU the LokPilot Standard is convincing due to its newly developed, excellent load control with high tact frequency and very good low speed characteristics, sensible configuration and outstanding value for money. The LokPilot Standard is a first class DCC decoder. 14 - 128 speed steps simply go without saying as well as 2 and 4 digit addresses. Thanks to RailComPlus® the decoder automatically registers at a suitable command station (e.g. ECoS). It supports all DCC programming modes and can be operated and programmed with all DCC compatible digital command stations: thanks to RailCom® one can also read out CV values on the main with a suitable command station. Programming is particularly comfortable with the ESU LokProgrammer where see all parameters in plain text on your PC monitor. The output stage of the LokPilot Standard decoder generates 0.9A continuous current and easily handles all commonly available DC motors as well as coreless motors; regardless if the motor is by ROCO®, Fleischmann®, Tillig®, Piko®, Brawa®, Bemo®, Faulhaber® or Maxon®. Load control with 20 kHz PWM frequency assures quiet running and lets your locomotives crawl slowly over your layout if you wish them to do so. Load control can be adapted optimally to the particular type of motor by means of three CVs. Due to the simulated inertia the locomotive will not jerk, not even in 14 speed step mode. The LokPilot Standard can also be used on analogue DC layouts. Therefore the operational area of your locomotives may well be extended to “non-digital” layouts without any problems. The LokPilot Standard decoder has four function outputs. The decoder with the 21MTC plug has two additional outputs without end stage, which can be utilised for controlling lighting and other functions in conjunction with a suitable adapter board (e.g. ESU 51968). All important lighting functions (e.g. blinking lights, Mars light, flashing light) are available and can be set just like the brightness of each output. The integral shunting mode assists you in delicate shunting manoeuvres in the yard, which is also enhanced by the option to turn off acceleration and deceleration with a function button. Thanks to a simplified method for “function mapping” similar to the method described in the NMRA standard all function outputs can easily be assigned to any function button (F0 to F20) according to your requirements. Of course, all function outputs as well as the motor output are protected against overload. We want you to enjoy the features of our decoders for as long as possible! The LokPilot Standard can be updated and, if necessary, new operating software can be uploaded with the aid of the ESU LokProgrammer. Thus your decoder always stays up to date, even after the purchase!